Using our own process technology laboratory with attached technology centre, we continuously develop our processes for water treatment, water recycling and wastewater treatment. We develop new plants or further develop existing plants, within the framework of customer orders or the development of our own plants. In our water chemistry lab, we test the efficiency of new high-performance chemicals in various fields of application. On behalf of our customers, we determine the optimum composition of water treatment chemicals for their treatment processes, then mix them according to recipe and supply the goods. Working within the scope of the research strategy “Reclamation and Recycling of Reusable Materials from Industrial Production Cycles and Wastewater”, the EnviroChemie researchers have developed a process for the extraction of aluminium from suds. The primary objective of the research project was to find an economic process which could be used to extract aluminium in different concentrations from strongly alkaline suds and to enable re-use of the suds. The addition of aluminium to the strongly alkaline suds reduces the service life of the suds and they become unusable over the course of time. The newly developed processed is based on converting the aluminium into a solid form (so-called zeolite precipitation) by adding soluble glass (alkali silicates) to the suds. The precipitates are separated from the suds by means of membrane filtration system with a cross-flow method. The recycling of the suds can function as a continuous process so that the operation of the operation bath does not have to be interrupted. As Dr Engelhart, Head of Research and Development at EnviroChemie, reports, the process has already proved to be successful for the processing of suds used for cleaning bottles in the beverage industry. Biogas, which consists mainly of methane and carbon dioxide, is generated during the anaerobic treatment of wastewater. A part of the carbon dioxide which is created dissolves into the wastewater in the anaerobic reactor, and the carbonic acid this creates leads to a fall in the pH value. As an alternative to using chemicals for the neutralisation required, EnviroChemie successfully installs its Biomar Ecomizer technology. The operating costs of the anaerobic system are significantly reduced. Payback periods of just a few years can be demonstrated for this process, due to the savings on caustic soda. We have already installed Biomar Ecomizer technology in a number of wastewater treatment plants for Baltika, one of the largest brewery groups in Russia. Tests at a large wine making cooperative in Germany have shown that the installation of the technology can also be of benefit there. We have incorporated electroflotation technology into our range of plants, using the product name E-Flo-Dr. Baer. With over 40 years of experience in this specialised technology, Dr. Baer Verfahrenstechnik provides a mature process. 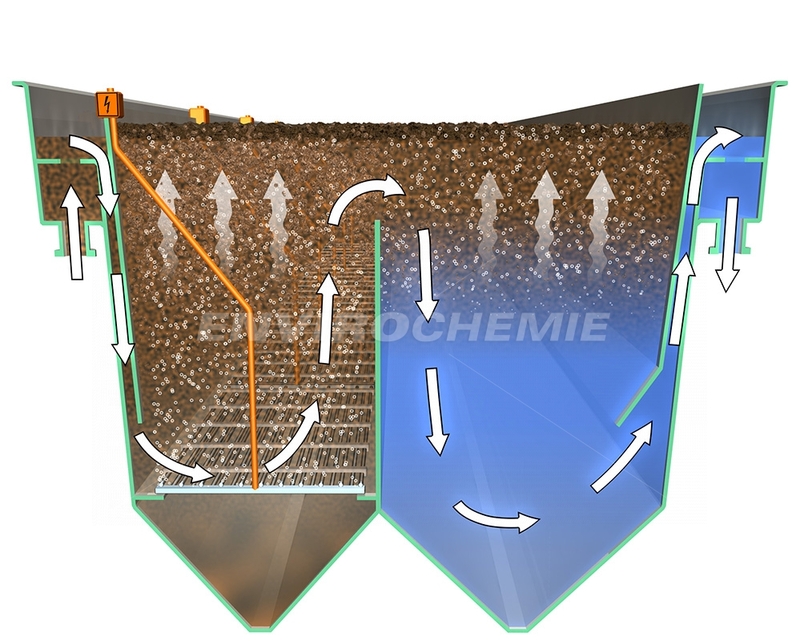 The technology has been integrated into the system series of EnviroChemie products for water treatment, water recycling, and wastewater treatment, giving access to models that have proven themselves hundreds of times, in the field of measurement and control technology as well as pumps and drive technology. This specialised electroflotation product complements the well-established Flomar® series of dissolved-air flotations. While investment costs are always higher compared to dissolved-air flotation, it can be used without any restrictions for water temperatures in excess of 80° C, and barely creates any foam. The precise separation of the flotate ensures a high degree of cleansing, eliminating the need for further filter stages. This makes E-Flo-Dr. Baer electroflotation especially suitable for the cleaning and treatment of water circulation systems. Decentralised water and wastewater technology is in demand worldwide. EnviModul modular plant systems make it possible for water and wastewater treatment plants to be assembled in a flexible manner. Compared with classic, centralised solutions in mixed structures, modular decentralised plant solutions offer advantages when it comes to costs, flexibility and speed of implementation. 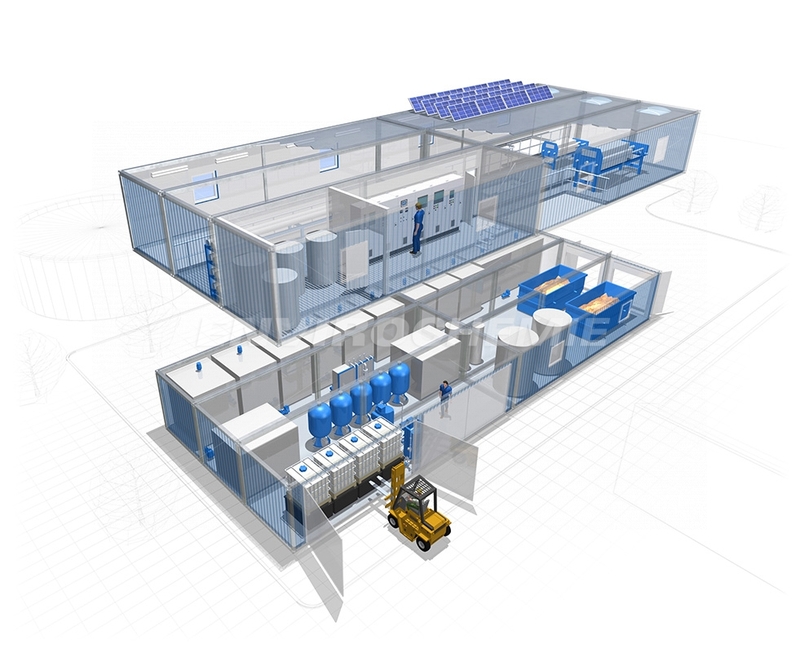 We have developed the independent, modular EnviModul system as part of a BlueCompetence product development program. Detailed view of E-Flo-Dr. Baer electroflotation plant: Minute bubbles of gas are generated at the electrodes and ensure an almost laminar flow in the reactor.